A drawing dated 1930, shows an illustration of a simple classic chair with legs reinforced by stretchers to the front and sides. 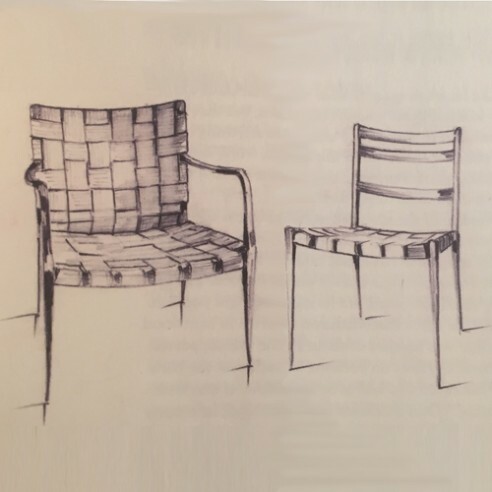 In 1931 a similar chair reappeared with the stretchers removed in a drawing³ alongside an elegant light weight dining chair. The seat of the chair is tilted back and the four legs taper down towards the floor. The back legs continue upwards, slightly arched and tapered to support the back of the chair. Mimat is the earliest example of Bruno Mathsson’s exception sense of proportion and scale. It can be seen as a natural evolution of an extensive cabinet making tradition influenced by his father’s highly trained sensitivity of the nature and characteristics of wood. By removing the stretchers between the legs the young Bruno Mathsson created a light elegant solution for a traditional chair type. ¹. From the article by Dag Widman. “Bruno Mathsson Architect and Designer” Yale University Press. ². Memo 12 May 1931, Svensk Form Archive, Stadsarkivet, Stockholm. ³. Bruno Mathsson International archive, Vårnamo Sweden.